or my consciousness of this moment. It’s creative, fulfilling and stress free. I often miss some of the stress… like messy grandchildren. They’re older now… and much more poised. that’s what I was trying to get to… via Darwin and my grandchildren. Children have been drawing stick figures since we grew thumbs. The talented ones drew horses and battle scenes and told stories of great heroes who fed the tribe through the winter. They chipped, chiseled, chewed the leather and became one with the ecosystem they called home. 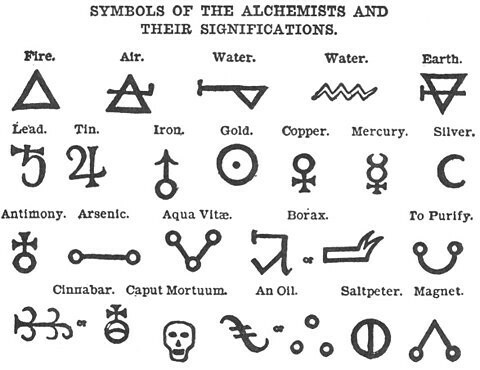 They drew symbols on burnt desert camel skins and rain forest tattoos, they etched stone mountain carvings and drew monks blood penned on parchment; throughout, certain symbols have been repeatedly depicted… thus solidifying their demonstrated place in human consciousness. The circle, square, spiral and cross are symbols that we learn by living and observing nature. Like gravity, we already know what a circle is when Mommy points at one and says the word, “Circle,” or before someone tells us the definition of gravity, we already have a relationship with gravity… ouch very much! The Half Full symbol is a circle with the full color spectrum around the outer perimeter. Within the circle are opposing black and white colors in an upper and lower orientation. The words “Half Full” suggests our answer to the age-old philosophical debate… is the cup half empty or half full? Yes, we are optimists… and we are willing to go the full circle, to embrace all colors and cultures and to walk in balance. will evolve the symbol; people who wear the symbol will evolve it and the symbol will evolve into a brand… a brand that embodies peace, love, respect and reverence for life. Half Full: one hundred, fifteen. and there’s SO many details to pay attention to! Bead brains want/need to know everything about gemstones, crystals, metals, lost wax casting, lapidary, rock hounding, tumblers, polishers, drills, chains, 3D printing technology, social media, spreadsheets, business management, marketing… etc. Who knew beads on the brain would lead to so many doors? 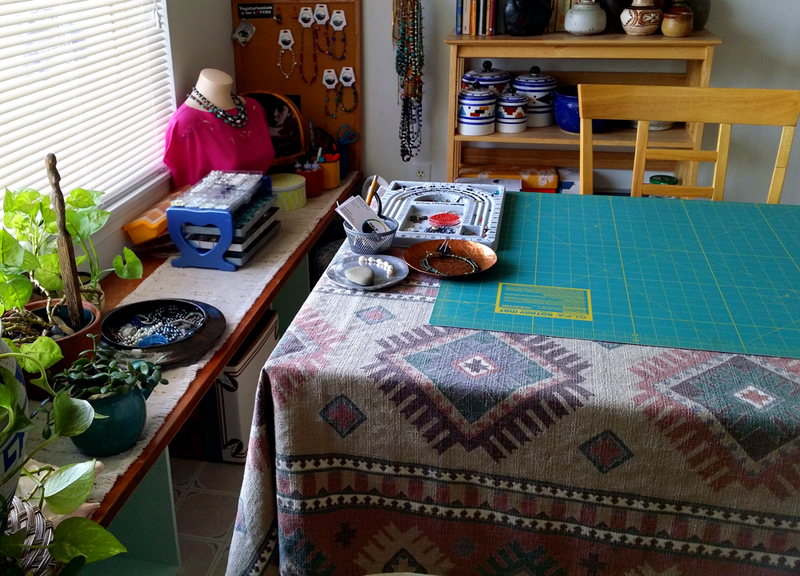 I have reorganized my beading area. 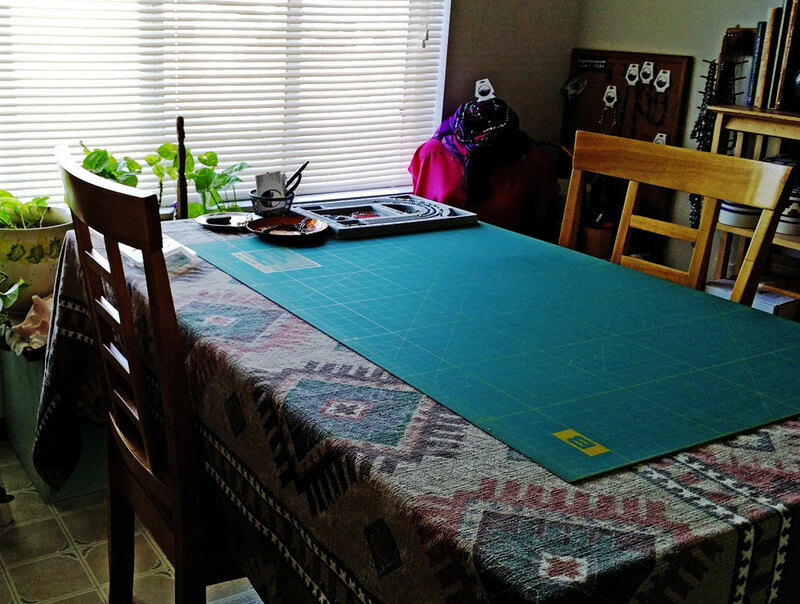 Above is the table Before I rearranged. From this angle you can see where some of the organizing took place… where hidden trays, jars and tins hold beads too numerous to count. On the characteristics of a bead brain. To be a bead brain, one must like beads. One must shop for and buy beads and beaded jewelry. 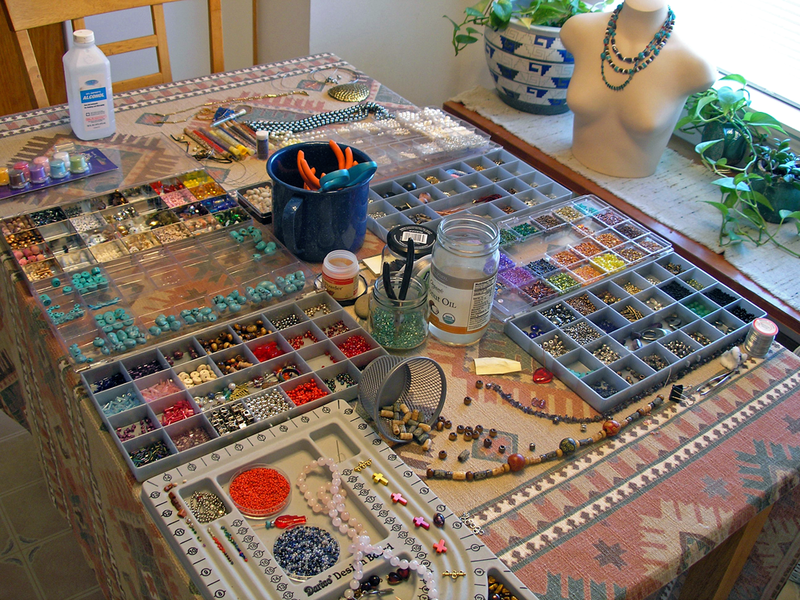 One must design and create with beads. One must fall asleep with beads on their mind. That’s when you really know. Anicca means “continual change”. This too shall pass. 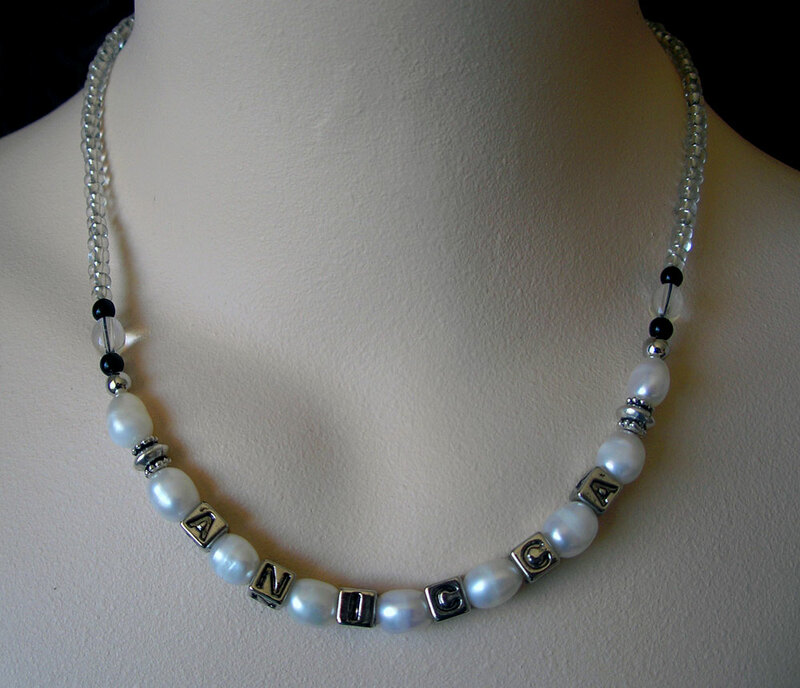 This necklace frames cultured freshwater pearls around antiqued silver letters spelling out ANICCA, suggesting that time and life are meant to be enjoyed now… in this moment. 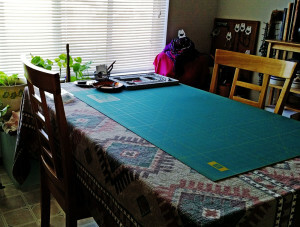 On becoming a bead brain… I never saw it coming. I purchased a bead collection at a garage sale for the grandchildren’s craft activities… some of the beads were interesting, beautiful and whimsical. I enjoyed beading with the grandchildren. Then Erin came to visit for a few days, bringing her sea glass creations with her. 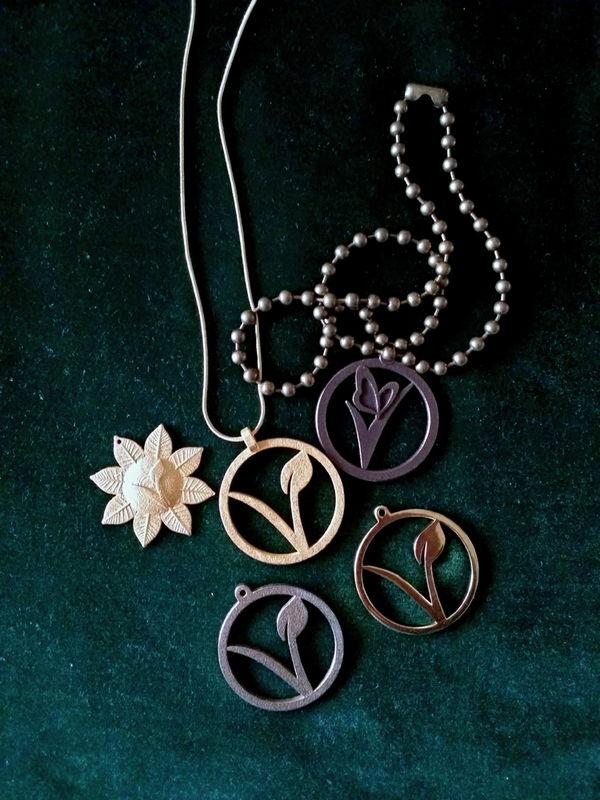 She showed me a few things about jewelry making, which in turn made me want to know more… then a door to another world opened up. My days became filled with rocks and gems and wires and clasps and pliers. 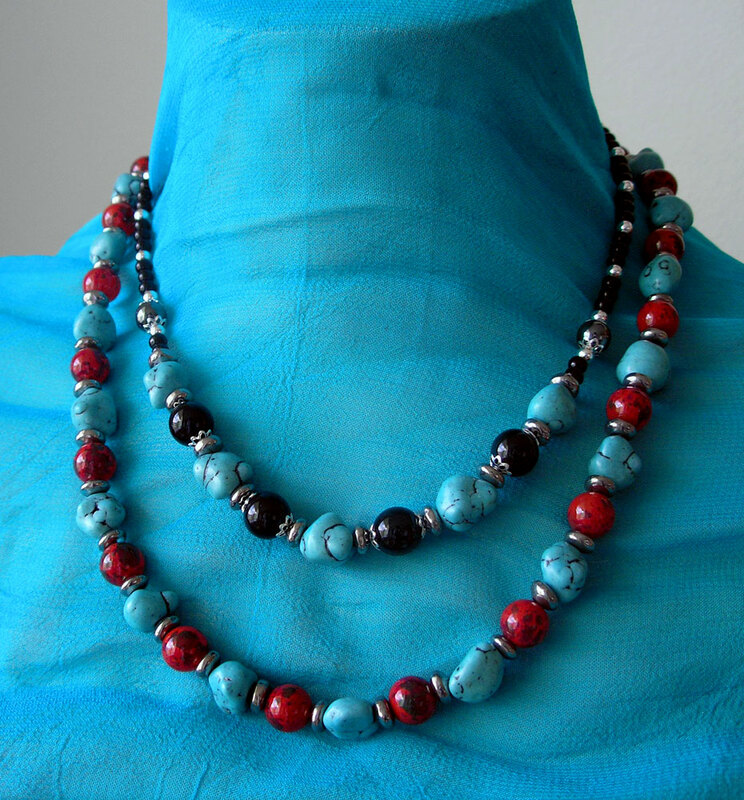 Onyx, Hematite & Turquoise coupled with Turquoise Loves Red. 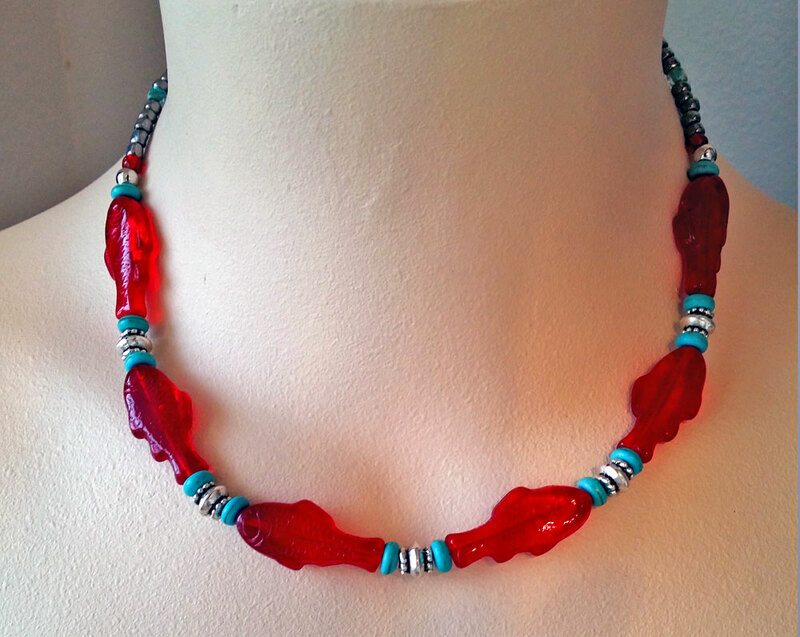 Turquoise, onyx and hematite with red and silvery glass accents. On coming to terms with becoming a bead brain. I’ve experienced bead shopping mania. I think of the juggling act of working women when I design. They need their accessories to multi-task as well. They want to look fabulous even when they’re not feeling it. They thrive with accessories that rock a business suit, as well as an evening dress. 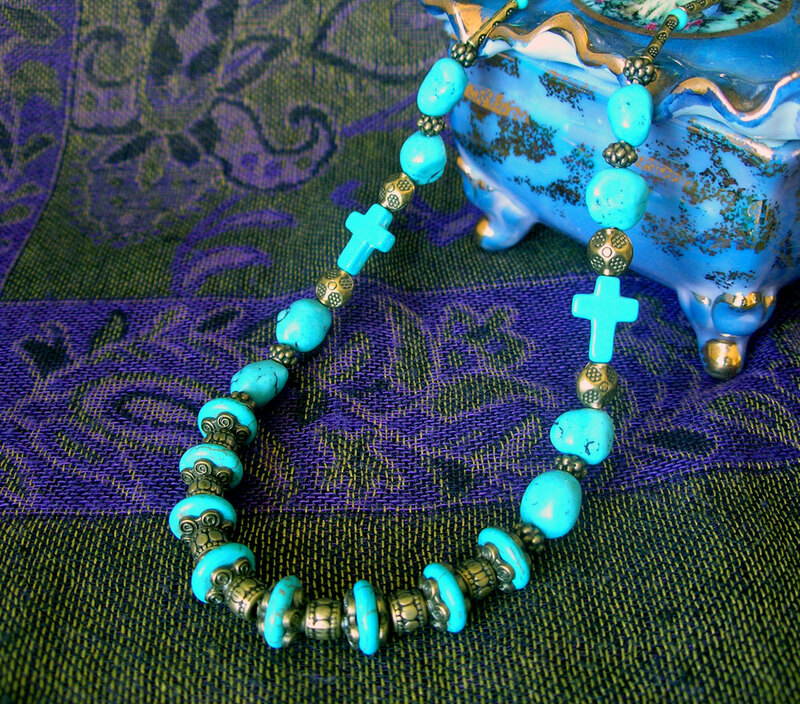 Cross of Turquoise has an air of the Orient with a Southwest flavor. It’s rustic, yet refined… with a strong clasp to secure it’s weight. On becoming a bead brain. but in truth, I hadn’t really paid much attention to beads or jewelry. I have a few prized pieces that have survived thieves and travel. They’re old friends who live in a box. But so much has changed and my inner bead brain has metamorphosed. 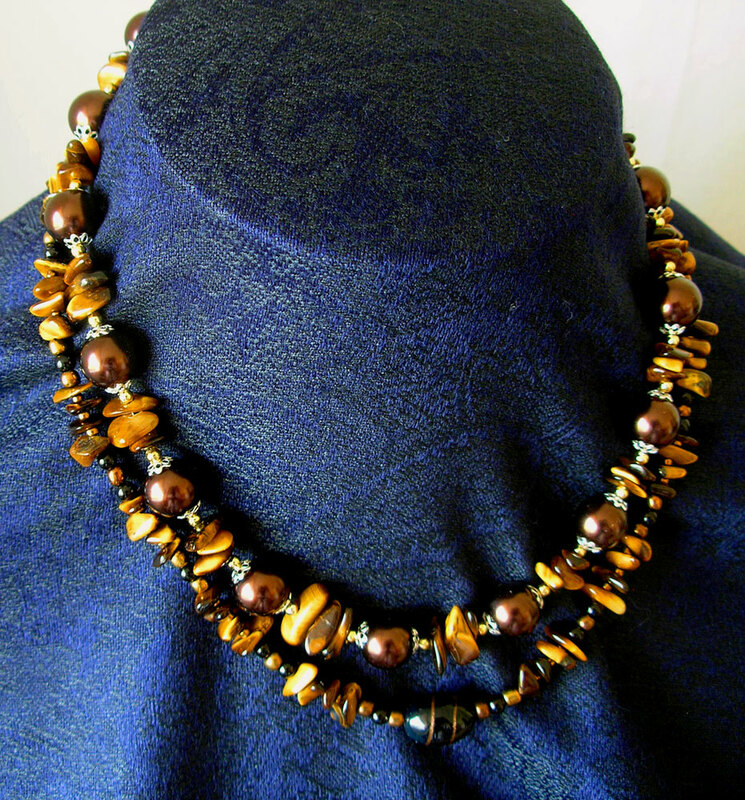 I’ve had these Tiger’s Eye and Eye of the Tiger beads since forever. I just knew I’d do something with them someday.